The following is an excerpt from an interview I conducted recently with the folks at TechnologyAdvice, a leading online provider of information resources to help IT professionals make informed buying decisions. For the complete interview, see the TechnologyAdvice marketing blog. Reposted with permission. 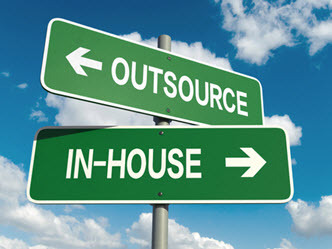 (TA) Marketers tend to think of outsourcing as an auxiliary measure — a lifeline for when you can’t afford to do things in-house, or you don’t have the manpower. How is working with a B2B agency different/more complex than that? (HS) I don’t believe hiring an agency should be a decision of whether or not you want to outsource your marketing. I have no problem with our firm being an “on demand” resource for if and when people need us. However, I do think that we add more value in those engagements where we’re more of a strategic partner and involved across a range of demand generation activity. Fact is, there’s a lot we can contribute on a strategic level – what’s working for other companies, where to best spend your demand generation dollar – that has nothing to do with more tactical services like media and creative. (TA) In your experience, what are a few marketing initiatives every B2B company, no matter the size, could feasibly allow an agency to manage and expect to see a positive return? (HS) SEM (paid search) is one. I’ve seen very few companies, at least on the B2B side, manage SEM in-house effectively. One, it’s pretty much a full-time job, and secondly, the benefits of managing multiple search accounts (as we do) is that you learn what’s working, you evolve your best practices very quickly, and you can cross-pollinate successful techniques across clients. (TA) I want to focus particularly on content syndication for a moment. A lot of companies don’t understand the multiplying effect that working with a syndication partner can have on the success of a single asset. Can you address that? (HS) I’ve always been a big fan of content syndication. In my experience, it’s the rare client – at least in the B2B space – for whom content syndication shouldn’t be a foundational part of their demand gen mix. And syndication is a great complement to other inbound strategies like SEM and Social Media, by helping to ensure that qualified prospects who are out there researching a particular category, for example, find and engage with your company. Plus, as you point out, it’s also a very effective, measurable way to leverage the investment you’re making in content development. (TA) There are so many different varieties of lead generation providers on the market. What separates the true lead gen agencies from the glorified list wholesalers? (HS) When we research content syndication and lead providers on behalf of our clients, we’re looking first and foremost for competitive pricing and a proven ability to drive quality leads at volume. However, I also think transparency is important – how are the leads generated? Where will content appear? Are leads shared or re-sold? If answers to those questions aren’t crystal clear, you may be better off putting your dollars elsewhere. (TA) How important is lead nurturing, when you outsource some of your pipeline-building efforts? What does it look like to get outside help with lead nurturing (this is one of the services Spear provides)? (HS) Lead nurturing is absolutely critical. At the very least, an effective lead nurturing program enforces prompt and systematic lead follow-up (even on those days when sales is “too busy”), and will help ensure that you get maximum value from demand generation by nurturing leads along the sales cycle. The rise of marketing automation technology has given rise to a “do-it-yourself” mentality when it comes to lead nurturing, but technology can’t do everything. Lead management strategy, campaign workflow, email frequency, segmentation, offer/content strategy, email creative – these are all areas where an experienced partner can make a huge difference. (TA) Are there any particular programs or channels you think a B2B company should NOT outsource? Why, or why not? (HS) Would it surprise you if I said no? That doesn’t mean that every company should hire an agency like Spear. It really depends on the scale of your marketing objectives and your budget. However, I do believe that outsourcing even some of your programs to the right partner gives you flexible bandwidth, collective expertise, and a pool of knowledge that you’ll probably never be able to hire for. Plus, if you do everything in-house, marketing can get stale and insular. Sometimes it just makes sense to shake things up. This entry was posted in Ad Agencies, B2B Marketing, Demand Generation, Demand Generation Agencies, Direct Marketing Agencies, lead generation and tagged B2B demand generation agency, B2B Marketing, b2b marketing agency, Demand Generation, demand generation agency, lead generation, outsource marketing, technologyadvice on September 20, 2016 by Howard Sewell.